Relaxer is literally a dude sitting on a couch playing Pac-Man for ninety minutes. How much you enjoy the movie will depend on your tolerance for such an avant garde concept. There's definitely a lot of wacko humor here, as well as a cool connection to videogame history. I can see some people digging Relaxer's weird vibe; I'm just not one of them. Set right before Y2K, the film stars Joshua Burge as Abbie, a guy whose brother Cam (David Dastmalchian) forces him to engage in a series of dumb “ultimate challenges” for reasons that are never explained. Abbie always seems to fail them, but he wants one more chance. Cam challenges him to pass level 256 on Pac-Man – the notorious glitch where the screen becomes half full of garbed nonsense. Abbie is not allowed to get up off the couch until he completes this mission. That's the story right there. Oh sure, he gets a couple of visitors during the time he's parked on the sofa. Sarcastic buddy Dallas (Andre Hyland, seemingly doing an impersonation of Danny McBride) pops by, as does an exterminator planting a bug bomb. Through it all, Abbie just sits and plays, occasionally asking someone to bring him a snack. The final fifteen minutes make a hard left turn into something approaching horror as we sense months have gone by since the challenge first began. Relaxer is filmed in very long, unbroken takes, with the camera occasionally panning around the room. In that regard, it's similar to Jim Jarmusch's seminal 1984 indie Stranger Than Paradise. The difference, though, is that his film is about something, whereas this one is largely just a satire of slacker life. We never understand why Abbie and Cam have such a tense relationship, and because Abbie is such a passive character, it's hard to identify with him. Then, of course, you have the claustrophobia of the premise. Writer/director Joel Potrykus mostly keeps the camera right in front of Abbie, meaning that there's little variation in shots. After a while, the visual monotony of the movie can start to wear you down. That leads to your brain's sense of logic turning on, in search of stimulation. Cam leaves the apartment, so why doesn't Abbie just get up when he needs to? How does he use the bathroom? What is the point of these challenges? In fairness, those are not questions we're supposed to ask. Relaxer isn't meant to be taken literally. Also in fairness, the performances are...well, “good” might not be the correct phrase. Let's just say they accomplish what they're meant to. Abbie is a pathetic soul, brought capably to life by Burge. I have a feeling that Relaxer is the kind of movie you're supposed to watch while wasted. You have to admire the guts it took to make something so thoroughly bizarre. Stoners will love it. Nevertheless, watching it sober is an endurance test. 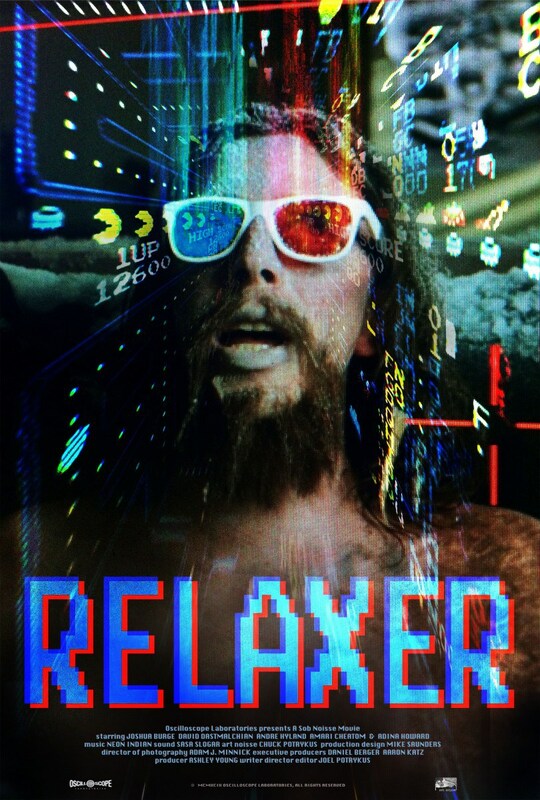 Relaxer is unrated, but contains adult language and brief violence. The running time is 1 hour and 30 minutes.